The history of surgery is the history of great ideas and inventions. Ideas so outrageous, no one had dared to imagine them, before someone did. Like using a piece of intestine to replace a cancerous oesophagus. Inventions so ingenious in their simplicity, the rest of the surgical world must have gone “why didn’t I think of that”, when they were introduced. One of the most brilliant inventions is, in my opinion, the triangulation method for suturing blood vessels. While reading Richard Hollingham’s book “Blood and Guts: A History of Surgery”, I was reminded of the simple beauty of it. The technique for end-to-end anastomosis of blood vessels was developed by French surgeon Alexis Carrel (1873-1944) in collaboration the American physician Charles Guthrie. For the invention, Carrel was awarded the Nobel Prize for Physiology and Medicine in 1912. Making a triangle out of a circle. Illustration by Øystein Horgmo © All rights reserved. The technique is as simple as it is ingenious. The ends of the two vessels are approximated by three stitches, each placed one-third of the way around the circumference. When the stitches are retracted the vessels form a triangle, making continuous suturing possible. It also minimizes the possibility of catching the back wall of the vessel with the needle. And you don’t have to hold the edges of the vessels with a forceps, thus avoiding the risk of bruising and swelling. By seeing beyond the limitations of the tube structure, Carrel and Guhtrie had solved the problem of sewing two tubes together (image credit). Alexis Carrel's own drawing of the triangulation technique. The termino-terminal anastomosis is effected by bringing the extremities of the vessels into contact, no traction being necessary. The ends are united by three retaining stitches located in three equidistant points of their circumference. By traction on the threads the circumference of the artery can be transformed into a triangle, and the perimeter can be dilated at will. Then the edges of each side of the triangle are united by a continuous suture whilst they are under tension. During the suture great care is taken to approximate exactly the surfaces of section of the wall. 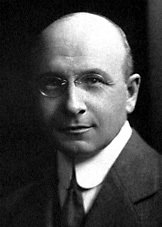 Alexis Carrel was an eccentric and controversial man. In addition to the technique described here, his research laid the foundations for major advances i organ transplantation. With English chemist Henry Drysdale Dakin he invented the Carrel-Dakin method of wound treatment, which was used in World War I. But later in his life he became an advocate of eugenics, arguing that democracy should be abolished and society led by a few “genetically superior” geniuses. During World War II, he worked for the French Vichy government, which collaborated with Nazi-Germany. The technique is quite similar to ‘purse string suture’ used in surgical procedures like appendectomy. Good write up. ya, simple, beautiful and genius. You are currently reading Triangulation at The Sterile Eye.